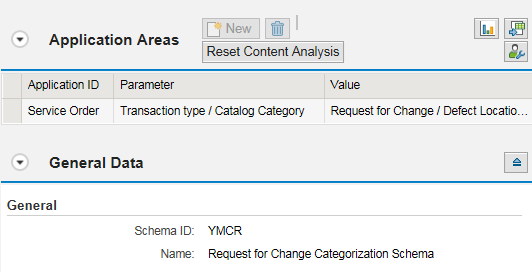 If you are a customer who is using Incident/Service Request/Problem with a Request for Change as a follow up that has a different categorization schema, then you will be interested to learn how to get rid of the pesky warning message “Schema X, category X is not a valid assignment”. Some of you might think it is silly to write an article on how to get rid of a warning message as it is not an error message. That would be my reaction too, but this one deserves an article. Why? Well, there are numerous reasons. This issue has been brought to SAP’s attention by multiple customers since 2012. We often devalue things because they seem so small or insignificant, but it is the little things that can make a big difference to user experience. One person at SAP took the time to document the resolution and share it with us – Thank you! For the purposes of this blog, we will use an Incident transaction type with Request for Change as a follow up to reproduce the issue. Note #1: Different categorization schema is assigned to an Incident and a Request for Change transaction types. Note #2: The Category option is unchecked in the Mapping Rules for Copy Control configuration for Source Transaction Type = Incident and Target Transaction Type = Request for Change. Open an Incident with Category selected. Click Create Follow-Up button and select Request for Change. Issue: Request for Change displays a warning message “Schema X, category X is not a valid assignment”. Select the Category on the Request for Change and click Save. The Warning Message is gone. Note: This step is what you would tell a user to do as a workaround to get rid of the warning message. Implement SAP KA 2728656 – Warning Message “Schema X_SCHEMA, category X is not a valid assignment”. The SAP KA describes several options to hide the warning message. One of them is to assign the subject profile SERVICE to the Source Transaction Type via IMG Activity Assign Subject Profiles to Transaction Types. The result is the categorization schema will not be copied from Source Transaction Type and hence the Warning Message will not be triggered. Thank you very much Yuliya for bringing this to our attention. That is the only way we grow, working together. Happy 2019.